RUAG's employees work on projects to complete another milestone in the U.S. facility. It took less than 15 months from move in date of RUAG into its location on the ULA campus, to go from empty space, to 135,000 square feet of production facility. The Decatur site now holds over 50 U.S. employees for the manufacturing of large composite structures such as payload fairings, interstage adapters and other future opportunities. 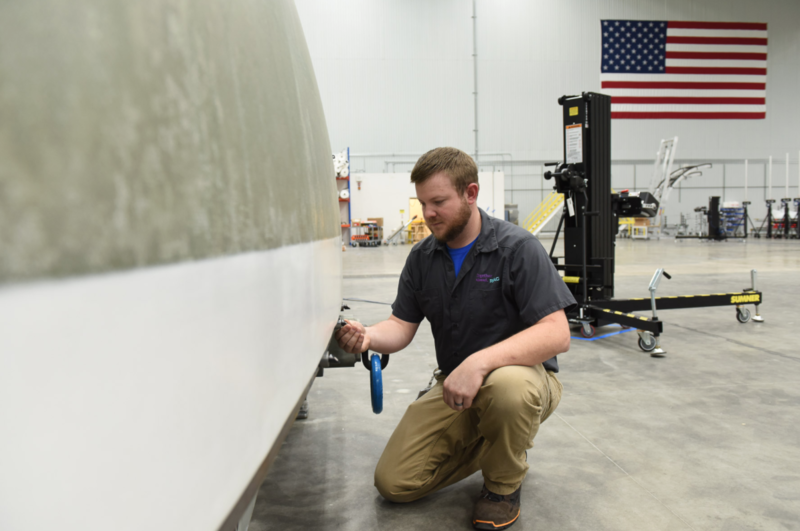 Now RUAG's workers will shift from facility setup, to actual production, as they begin the layup and bonding process of a U.S. five-meter payload fairing demonstrator. The state-of-art facility will use an industrial Out of Autoclave oven to cure the large composite structures, in a process that has already been proven successful and space rated on Ariane 5 and Vega launches last year. This Out of Autoclave process allows the massive carbon fiber components — which constitute one half shell of the payload fairing — to be economically produced in one piece. The ambient pressure of the oven hardens the composite structures, as opposed to the autoclave process of excess internal pressure and allows RUAG to cure entire half-shell pieces at a time, eliminating costly and time consuming vertical integration of numerous shell elements. The full process reduces throughput time by 50 percent, and enables RUAG to increase the delivery volume and sequence for payload fairings. Other processes that will be utilized in the Decatur facility, such as laser-assisted layering, the completely automatic nondestructive testing, and the ergonomic horizontal integration station all contribute to the leaner, faster, better process that RUAG Space can offer customers. 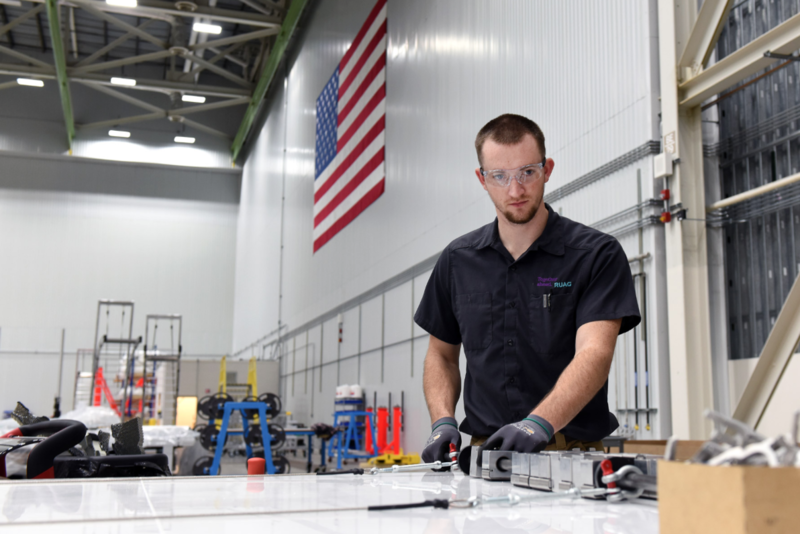 David Rowe, General Manager of RUAG’s Decatur Facility said that all of the successes that have led to this major milestone, are a testament to the hard work and determination of our workforce, and this is a critical moment for RUAG Space in the U.S.market. They are now fully capable of offering launcher composite structures made in the U.S., by an American workforce. Currently, the facility will operate on one shift only, with room for growth as the U.S. customer base continues to grow. The next major milestone on the U.S. PLF will occur when the demonstrator has been fully cured in Out of Autoclave oven, and will then move on to machining and integration. Following the build and testing of this first demonstrator, the facility will begin the production of fairings for ULA’s Atlas V rocket. RUAG Space, with headquarters in Switzerland, is the major supplier to the space industry in Europe with approximately 1,400 employees across six countries, and now a growing presence in the United States.